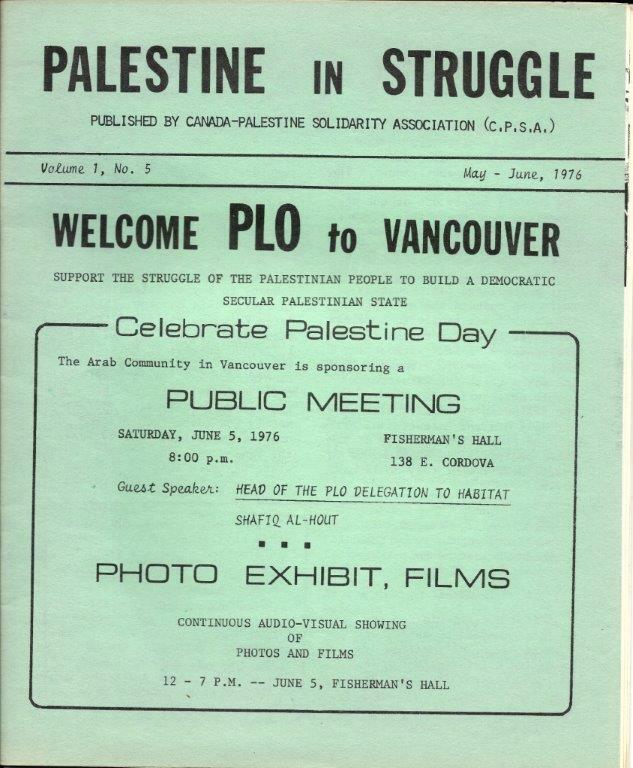 In 1976, the late Shafik al-Hout sat in the living room of a house in Vancouver, Canada with local supporters and passionately tried to mobilize them to be active for Palestine. Give the Palestinian people whatever you can, he said, “even if its just your smile”. Shafik was known for his eloquent speaking and this comment was part truth, part sarcasm and part tragedy. The fact that Al-Hout even made it to Vancouver at all was an achievement. The Canadian government of the day had the previous year refused to allow a PLO delegation to attend another UN Conference in Toronto (forcing the relocation of the conference). 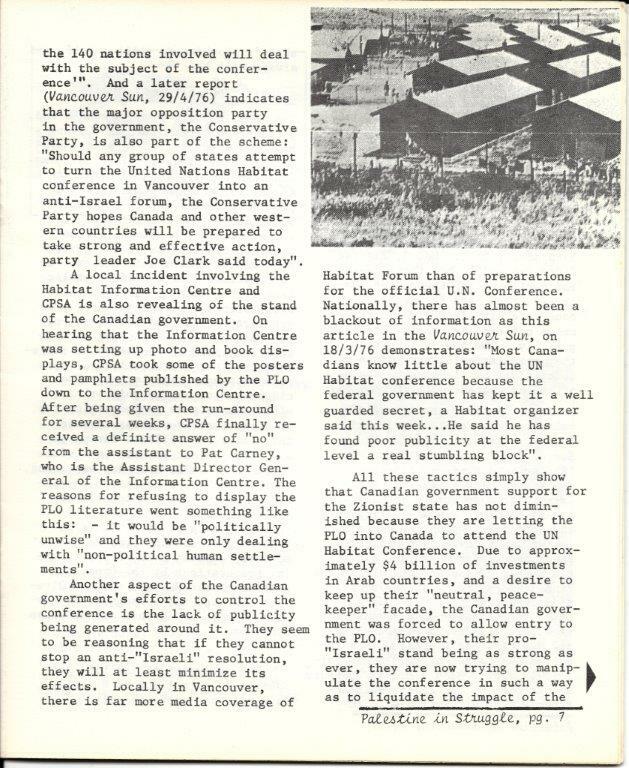 And the year after, even the Vancouver City Council unsuccessfully made moves (which were later reversed) to have the Habitat Conference cancelled. Once the reality of the conference proceeding became evident, a wide swath of federal Canadian politicians and officials as well as the Israeli ambassador to Canada, rushed to declare that the Conference must be “non political” and not become an “anti-Israel forum”. In one aspect, regarding the breadth of public support for the Palestinian cause, things have definitely improved. 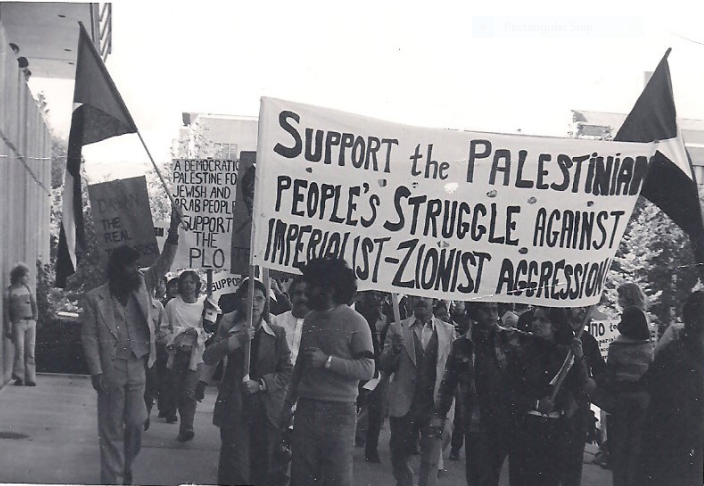 However, this broader support has till now often been more diluted and less principled that what constituted Palestinian solidarity in 1976. There is no longer the same strong leadership by the Palestinian Canadian community to drive the solidarity work as before, a reflection of the serious divisions in the Palestinian movement in general as well as the constant psychological pounding in the West on “terrorism” that imbues all levels of life for Arabs, Palestinians and Moslems in Canada. Groups that were presenting language skill programs have had their funding rescinded and been viciously smeared because the government did not approve of their politics. The heavy-handed moves by Canadian Immigration and Multiculturalism Minister Jason Kenney in 2009-2012 against the Canadian Arab Federation, Palestine House and others highlight some of the more blatant examples of creating a climate of censorship with harsh penalties for those who do not tow the government line. This absence of leadership by Palestinians themselves in work done in their names has been exploited by many liberal (some of them well-meaning) forces who place themselves as the arbiters on what is acceptable, where compromise is necessary and especially what principles, if any, may constitute a red line. Palestinian activists sadly note that ideas and positions they have been promoting for years that were constantly rebuffed, suddenly become more acceptable when they are espoused by a Western progressive, or even better by a celebrity or a Jewish progressive. This is not to say that there haven’t been extremely positive developments, like the statement last month by Jewish Voice for Peace (JVP) in the U.S. that “unequivocally opposed Zionism”. Or Gideon Levy’s new article in the Israeli paper Haaretz stating that “Its Leftism or Zionism…you can’t have both”. Since its founding 120 years ago, Zionism has always claimed that it represents all Jews and that Israel is the “Jewish homeland”. The recent Israeli “Nation-State” law is the clear manifestation of this ideology, although the world for the past seventy years was duped (many willingly) with the Israeli slogan of being “the only democracy in the M.E.”. The new law is also meant to redefine anti-Semitism by claiming that since Israel represents the Jews, any criticism, repudiation or hatred of Israeli brutal, racist and genocidal policies must therefore be treated as anti-Semitism. Perhaps then progressive Palestinian groups will no longer be vilified for taking a clear anti-Zionist position, for stating that they, as the direct victims of Zionism, have an inalienable right to denounce their oppressor and his ideology. Perhaps then Palestinian groups will no longer be labelled as extremist, or as divisive, or as marginalizing themselves, when they call on their supporters to also oppose the ideology that has driven their nation and people to dispossession and turned their lives into a living hell under apartheid, occupation or in exile. And perhaps then, Palestinian groups will not be expected to show gratitude for “just a smile” or the empty gestures of opportunist politicians or the crumbs of charity. Palestinians will, however, always remember and be grateful for the genuine allies who have been practicing solid and effective international solidarity and support.